As Chinese New Year approaches, everyone's looking for Chinese-themed slots to play. Slotastic launched the new Fu Chi slot earlier this month and will introduce another Asian-themed game in February. Today they unveiled their new Fantasy Mission slot from Realtime Gaming which is inspired by Chinese film legend, Jackie Chan. Until Valentines Day, they'll give you 50 free spins on the new game! 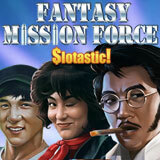 The Fantasy Mission Force slot game has explosive bonus features to maximize your wins. If you get a Scatter on the first reel and a Wild on the last reel you'll get seven free spins. Prizes are tripled during the free games. Also during free spins, the Kaboom! feature adds a Bickford Fuse to some symbols. Three or more of these trigger up to three extra free spins per fuse and can even blow the seven free spins into unlimited free spins. Slotastic is giving 20 free spins on the new Chinese slot game until February 14, 2018. Fantasy Mission Force is based on the 1983 Hong Kong horror action film starring Jackie Chan. After four World War II Generals are taken hostage, a group of misfits including two kilt-wearing soldiers, a con artist and a femme fatale encounter two small-time crooks, one played by Jackie Chan. Chan follows them in hope that they will lead him to a cache of money. Play-through: 30x. No maximum cash-out. Slotastic has some other great Chinese slots and they're getting more! Celebrating the upcoming Year of the Dog, Fu Chi’s Lucky Dog wild symbol doubles any win its party of. Scatters trigger up to 50 free spins where wins can be tripled. The next Chinese slot game, Shanghai Nights, is expected next week. With an expanding Wild and a free spins feature with doubled wins, the sleek new game celebrates the glamour of China’s busy port city. Another Jackie Chan game, Eagle Shadow Fist, is also in the works at RTG. All of these new games will be in the mobile casino for smartphones and tablets as well as in the download and instant play online casinos for desktop and laptop players.